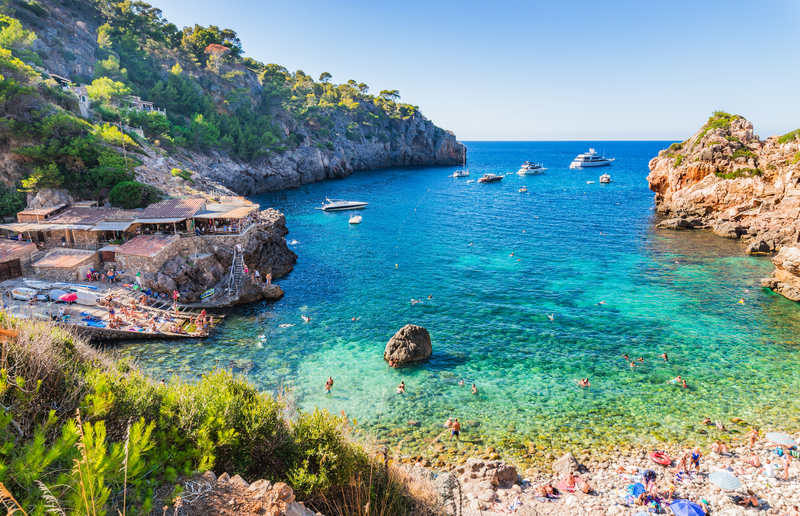 From north to south, Menorca, Mallorca, Ibiza and Formentera are the four main islands of the dazzling Balearics, east of mainland Spain. As soon as the springtime sun arrives at these destinations, so too do the holiday-makers seeking out hidden coves, rocky headlands and sandy bays. 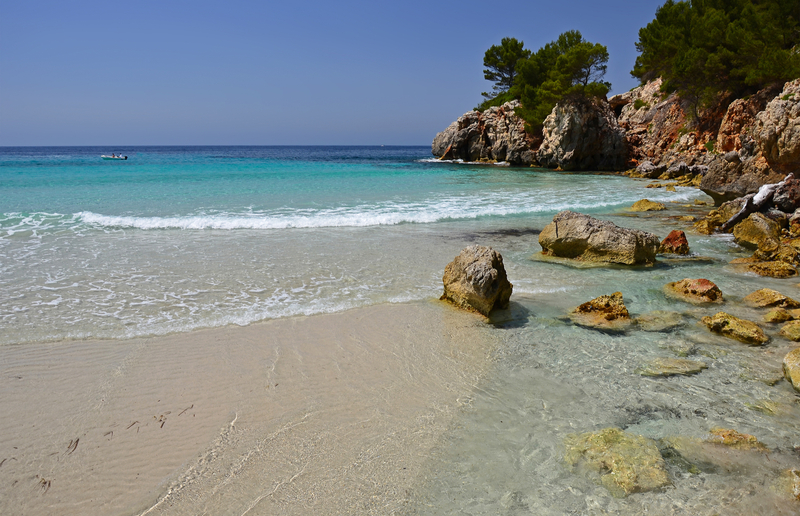 From buzzing spots and local hangouts to gems only accessible on foot, here are the seven best Balearic Island beaches. Once you’ve negotiated the narrow roads and found a space in the car park (not guaranteed in the summer months), a short walk brings you to an arc of fine white sand in a steep-sided gorge with dense forest on all sides. The clear, shallow water of this cove on the southwest coast is sheltered from the wind – perfect for snorkelling and for children to play and swim. 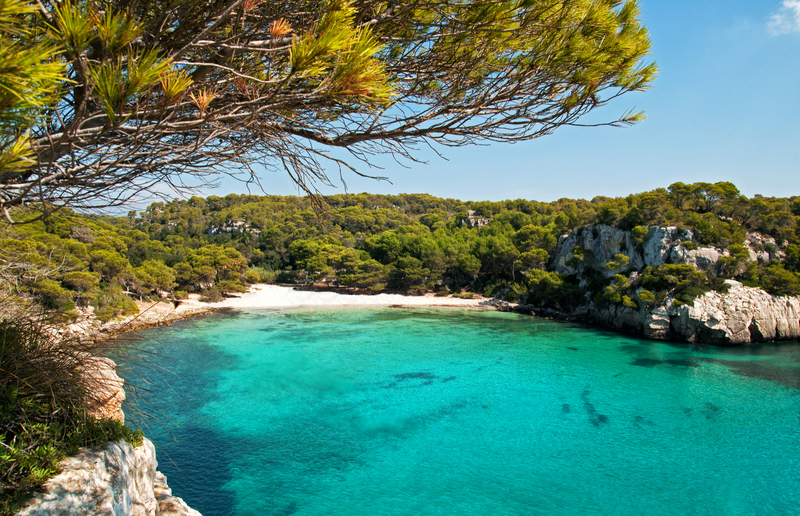 You can reach this secluded bay on Menorca’s central south coast one of two ways. Clamber along pine-clad clifftops on the Camí de Cavalls from either Binigaus or Cala Mitjana, which takes around an hour. Alternatively, pick up a boat ride from nearby Sant Tomàs. If you’re walking, wear trainers and if you plan to swim (who wouldn’t? ), take water shoes, as there are sharp underwater rocks. Along with a sense of adventure, bring your own supplies. Even in the height of summer there’s likely to be very few people here. 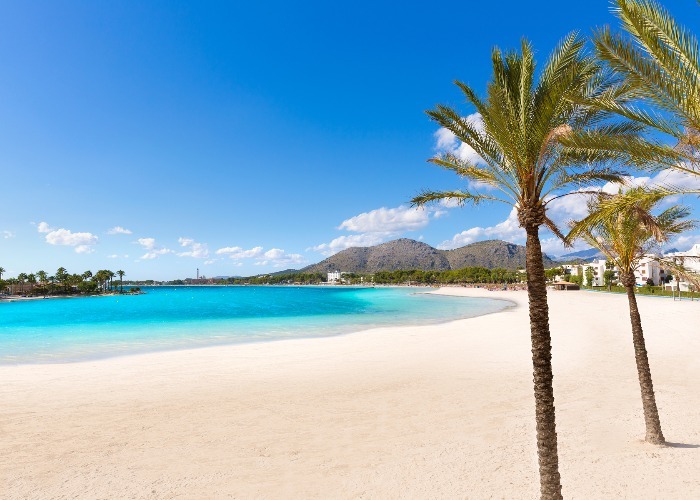 The largest beach in the Balearics, this 4 mile-long white sand beach is a major pull for visitors to Mallorca. Backed by purpose-built resorts and dotted with low-key restaurants, bars, sunbeds and parasols, there are also facilities such as toilets, showers and changing rooms. Vendors tout watersports and cruises but aren’t pushy. If it all gets a bit much, stroll south towards quieter Playa de Muro which is sprinkled with sand dunes, pine trees and juniper bushes. 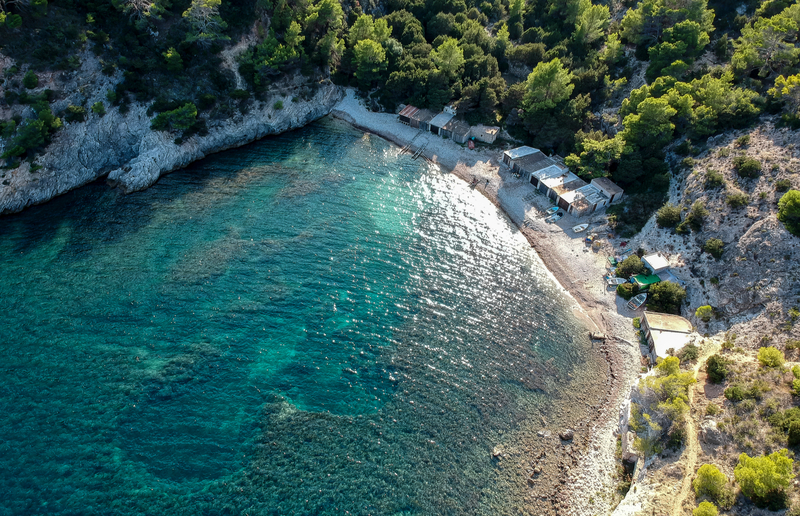 No longer quite the secret beach it once was, the rocky shingle cove of Cala Deià still retains its dreamy, hideaway quality. A stream of boats ferry well-heeled passengers from the super yachts offshore to dine on the terraces of Ca’s Patro March, the destination seafood restaurant made famous by its appearance in television drama The Night Manager. Meanwhile, holiday-makers swim in the blue bay and daring kids leap off rocks into the water. Bring something comfy to sit on (locals set up early with deckchairs) and bring your best people-watching sunnies. Famous for spectacular sunsets and drumming sessions that go on well into the night, Benirrás is a true Ibiza experience. On the rugged north coast, this blissed-out sandy beach and its hippy market attracts drummers, dancers, guitarists, fire-eaters and curious tourists all summer long. It’s a protected coastline so there are no hotels and the beach is backed by nature reserve. The market is on Tuesdays, Fridays, Saturdays and Sundays from May to October, and the biggest and best nights for drumming and old-school Ibiza atmosphere is Sunday. 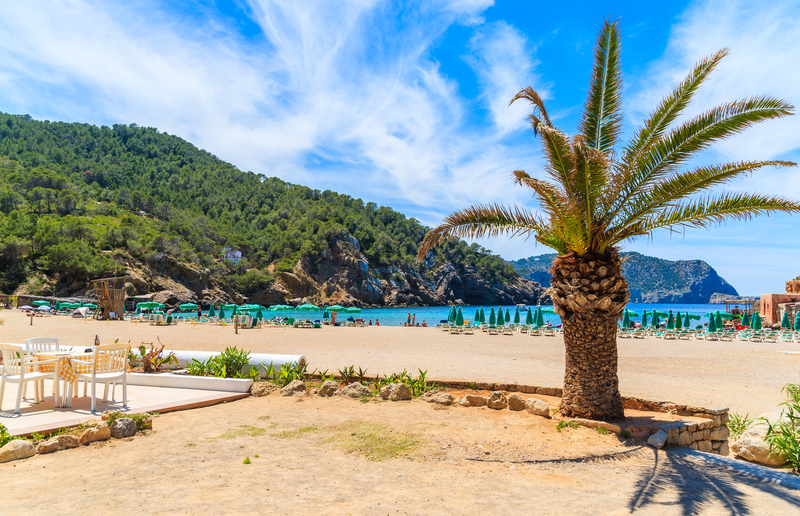 Llentrisca is an atmospheric little gem of a beach on the quiet southwest coast of Ibiza. There’s a small car park around 2.5 miles beyond the village of Es Cubells but you’ll need to ask permission to drive beyond the barrier. From there, it’s a steep and demanding track down to the pebble beach – all completely worth it. You’ll be greeted by the sight of a traditional fisherman’s cove with a couple of shacks and little rickety wooden jetties that line up into the blue sea. Quiet, unspoiled and perfect for lazing away a day (make sure to bring supplies). Diminutive Formentera is a favourite day trip from Ibiza and this long spit of soft white sand with pretty islets dotted offshore is a big part of the attraction. The shallow turquoise water gently laps at both sides of the narrow peninsula with seashells and coral scattered along the shoreline. Ses Illetes is largely undeveloped but it does get very crowded in peak season so get there early in the day to nab the best spot.